Another post in the ongoing series, Is it Art or Fashion? This go 'round I'd like to examine the idea of multiple uses for a piece of art. In my case, for example, can it hang on the wall and be worn (not at the same time, obviously)? Reflections II silk from the Aachen series sewn to canvas. Reflections II silk twill scarf, limited edition of 15. Is Reflections II art or fashion or both? In the top photo, the 36x36 inch silk has been sewn loosely, in a sculptural fashion, to a canvas. Art, right? In the lower image, the silk has been photographed to show a way in which to wear the piece. Fashion, right? Ultimately, of course, it's up to you. But, the idea of wearable art is one that intrigues me, given the fact that both these pieces are mine and to me equally beautiful. Rikki Nimon stitches the silk, Snowfall Blooming from the War and Nature series, to a 60x60 canvas. Background paintings are by Pamela Staker. 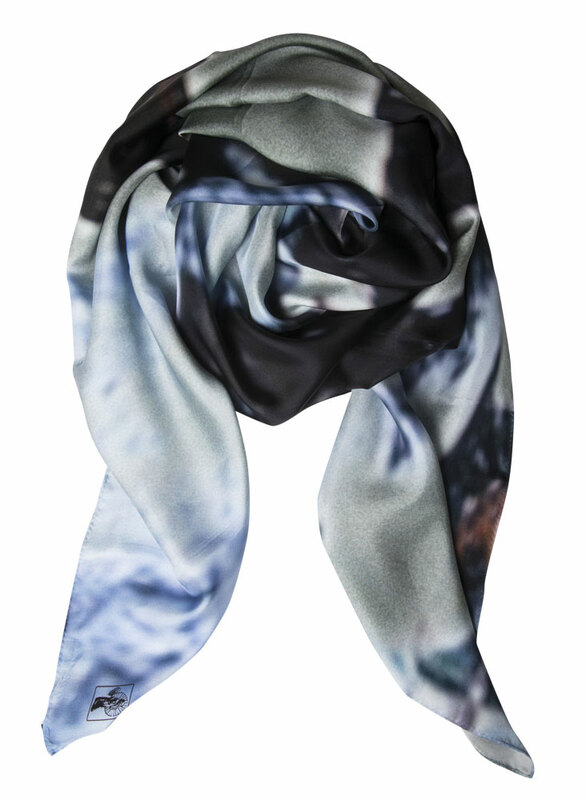 Snowfall Blooming silk twill scarf, limited edition of 15. Here's another silk piece doing double duty: Snowfall Blooming from the War and Nature series. And finally here's a silk piece that a client has displayed in a way that allows the same piece to be worn or hung. Berlin Wall I silk twill scarf hanging in a private collection. It can easily be slipped off the rod and worn as a scarf or even a belt. Do you look at the object differently, depending on its form? Each of my images tells a story; perhaps better understood hanging? But wearing it, brings the story along with you to share. I'd love to hear your thoughts, not only on "Is it art or fashion? ", but how you may have multi-purposed art you've either purchased or created.